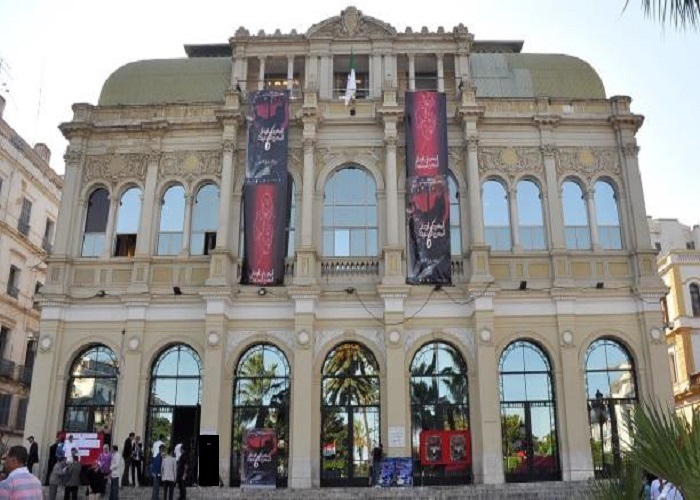 There are three brilliant playwrights who shine the Algerian theatre: Kateb Yacine, Abd elkader Alloula and Slimane Benaissa .Their works are successful contemporary theatre which is formed through the exploration and integration of cultural and social issues relevant to a popular audience. Kateb Yacine’s first play version Le Cadaver Encirclé (The Cadaver Encircled) was firstly performed in Tunis in 1958.He published in 1970 another play L’homme aux Sandals de Caoutchouc (The man with the Rubber Sandals).In 1971,he wrote and produced his first play in Algerian Arabic Mohamed ,Prends ta Valise (Mohamed, Take Your Suitcase) . There is a recurrent terminology of war in his plays, interviews and speeches. He is harassed or hampered in his task; his plays were and are still banned from appearing on TV, Radio…He was also banned many times from giving public lectures or making speeches in public. In 1974, he produced La Guerre de Deux Mille Ans (The War of Two Thousand Years), an historical play mainly about the struggles in Algeria, Vietnam and Palestine. All his plays have had a resounding throughout the country and in France. But there is alcohol and hashish in Yacine’s plays, the characters swear, the bourgeois and religious figures are attacked and ridiculed, and people revolt. Indeed, his early works which were written in French had already brought him many enemies mainly among muslim and conservative Algerians .He was awarded in France, The National Prize for Literature in 1986 for his latest publication L’ouvre en Fragments. Abdelkader alloula is a playwright, director and actor who developed a new form of theatre which draws heavily upon traditional cultural elements. In 1963, he was offered a job as a professional actor in Algiers, he acted five plays: The Children of the Casbah, The Oath, Life is a Dream…He wrote and directed: Al Khobza 1970(loaf of bread) which portrays the poor living conditions of the lower classes of society and their daily struggle, Al Mayda (the table) 1973, Hammam Rabbi1975. 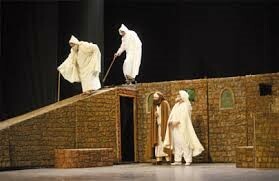 He used the art of the Maddah in his plays (drama).Alloula’s language combines borrowings from the traditional heritage and present daily life and from modern standard Arabic, the language used in education and by the press. Slimane benaissa, between 1969 and 1971, took part in several plays. He also translated Kateb’s La Poudre D’intelligence and wrote a play entitled Al Shaab,Al Shaab(people, people).In 1977,he wrote and produced two plays ,Yum Al Jumaa(Friday)Al Mahgur(the despised).In march 1982,he produced Babur Ghraq(a ship sank).With this play he became an established playwright and director in Algeria like Abdelkader Alloula and Kateb Yacine .He was one of the main contributors to the collective production of La Femme Algerienne (The Algerian Woman) ,a controversial play about the harsh situation of Algerian women in a male dominated society .The play was performed for one year 1969-1970 because of its appealing theme and the polemical debates it generated.